When you’re four years old, imaginary monsters under the bed can cause very real anxiety. Scientists say that the fear of the dark is an evolutionary mechanism, passed down to us from our ancestors who were regularly attacked by nocturnal predators. As we grow up, it takes time for our brains to realize that our fears are unfounded. Psychologists believe that 50% of children between the ages of 2 and 7 are afraid of the dark. And left untreated, that fear can continue on into adulthood: Among grown-ups, 8% of women and 3% of men are scared of the dark, which often leads to insomnia. Most parents don’t take their children’s fears of darkness seriously. If they’re particularly annoyed that their toddler is crawling into bed with them every night, they might buy them a nightlight, which does not help children develop the coping mechanisms to survive with the light off altogether. The most common way adults tackle kids’ fears is to try to rationalize with them, telling them there’s nothing to worry about. I think there is a lot of skepticism that magical thinking can cure real problems. Russo remembers being scared of the dark growing up. When his nephew suddenly started experiencing a lot of anxiety before going to sleep, it reminded him of his own childhood fears, and he was shocked that there weren’t any better products on the market to deal with it. So he decided to invent one with the help of a team of child development specialists. The solution he came up with is Glow Away. The product includes a book about a little magical fellow called Boo who can cast a spell that gets rid of monsters that hide in the dark. There is also a blanket in the kit that lights up with that spell when the room is dark. To most parents, the idea of fighting imagination with imagination might seem unconventional, but Russo says that the product is based on the latest child development research. When children are too little to fully grasp that their fears are fictitious, magical thinking can be deployed to help them feel in control of the situation. “In comparison to an adult, a child is encountering many more situations where things are unknown to them,” says Eric Walle, an assistant professor of child psychology at the University of California, Merced. “When they can’t make sense about what noises are in the middle of the night, their imagination serves a purpose, which is to make sense of things that don’t make sense to them. 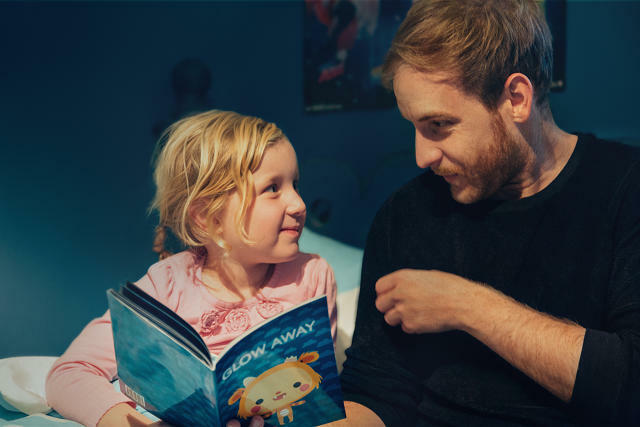 [Glow Away] seems like a reasonable way for them to begin to work their way through their fears.” That said, Walle believes parents have been trying to deal with this problem creatively for a long time, including using similar storytelling tools, to achieve the same effect. The Glow Away kit, though, is not cheap. It’s currently available for $129 on the company’s website. Investors believe that Russo and Cramer might be on to something. They have already received $20,000 in funding from Virgin StartUp, Richard Branson’s nonprofit that helps young entrepreneurs. They’re also launching a Kickstarter on March 6. With the fresh capital, Russo is hoping to make a bigger splash in the market, find more ways to distribute the product, and hopefully drive down the cost. And then there’s one other thing.